Prolight + Sound - Three Week to go:With a revised hall layout, Messe Frankfurt has responded to an important demand of exhibitors and visitors by locating the entire ‘Audio, Sound + Recording’ product segment in Hall 8.0, the biggest groundlevel exhibition hall at Frankfurt Fair and Exhibition Centre. Previously, companies from this segment were to be found in different halls. Now, key players, including Adam Hall, Adamson Europe, Allen & Heath, Amptown System Company, Audio-Technica, Bespeco Professional, Coda Audio, Craaft Audio, d&b audiotechnik, dBTechnologies, DiGiCo, ES- Lawo, Link, Powersoft, Proel, Riedel, Sommer Cable, Valentini and Yamaha Music Europe, are concentrated together under the same roof. 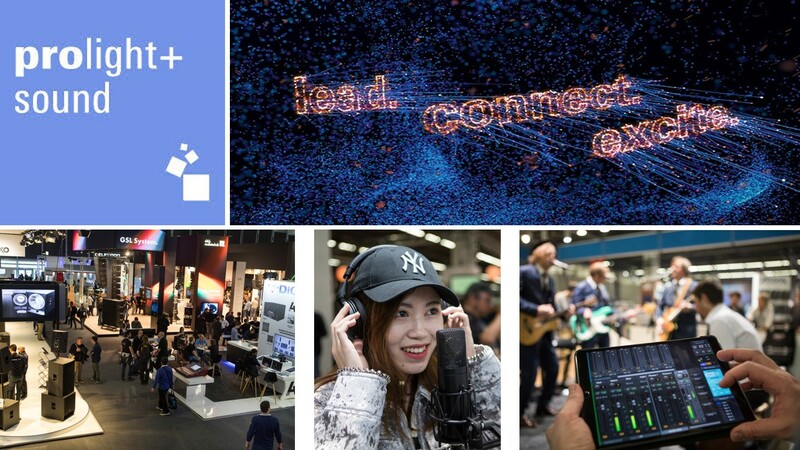 NAB - four weeks to go:This vast and comprehensive show floor showcases the latest game-changing tech, craft-altering trends and cutting-edge tools that change how we create, manage, deliver, consume and monetize content, no matter the purpose, no matter the screen. As of today we feature 26 companies and their approach at the NAB2019 Show. This list is continously updated. NAB2019 opens on 06April at the Las Vegas Convention Center. Global Production is an Italian company born from the extensive experience of an innovative team, who wanted to deliver industry leading quality to broadcasters and producers throughout Europe. For almost 20 years, Global Production has been an outsourced production partner supporting premier content producers of international sports events, live events, entertainment, TV and fiction programs, music and shows. With eSports being the current driving force in the entertainment and sports sector there is an ever-increasing demand for bigger spectacle and better viewer experience at eSports events, live on site, on TV or via streaming. From 22 February to 3 March the ESL One Dota 2 eSports tournament and Intel Extreme Masters stopped in Katowice, Poland. Around 18,000 visitors followed the battels live in the Spodek Arena and several million via Internet stream. The perfect stage for Robycam Germany’s cable camera system. Betamobil again produces the Alpine Skiing World Cup events for ORF at all locations outside of Austria for for the 2018/2019 season. Two OB Vans: the HD6 and the HD7, were, are and will be on the road in 17 European race Locations including the World Cup Final in Soldeu / Andorra.To simplify the technical infrastructure, 2 BroaMan MUX22 systems, each with one Optocore X6R-TP, are used at each World Cup location. This allows the set up of xtremely flexible stage box systems for the transport of all the required signals to the presenter / interview position as well as to the commentator position. Since coming to the global stage with appearances on Britain’s Got Talent and opening for Penn and Teller in Las Vegas, Swedish magicians Brynolf and Ljung have been leaving audiences across the world dumbfounded with their stylish take on street magic. The duo’s latest live tour, ‘Cirkeln’ (Circle) takes them back to their homeland, with 44 dates across Sweden in a wide range of venues, from traditional theatres through to outdoor arenas. Live events specialist Cloud Production is responsible for translating the magicians’ deftness and sleight of hand for packed auditorium audiences each evening. International singing competition The X Factor made its debut in Malta and quickly broke a longstanding record to become the most viewed programme on Television Malta. Lighting for the series was entrusted to Nexos Lighting & Video who worked together with the rigging and technical team. Lighting designer Anton Borg Olivier joined the team to work on the live broadcast finals, helping to manage the increased TV lighting requirements and deliver that extra kick to the show. For the control room that serves its Grand Théâtre hall, Opéra National de Bordeaux (France) has selected a 24-fader Lawo mc²36 audio mixing console, which was installed in late August 2018. After extensive tests involving consoles from six manufacturers, the mc²36 was selected for its superior sound quality, competitive pricing and a compact footprint that fits snugly in the Grand Théâtre’s control room. The LaON systems from Broadcast Solutions will be used, among other productions, for the second edition of a successful programme by the Spanish public broadcaster RTVE from the NON STOP studios in Fuente el Saz and for the second edition of another successful dance programme which just started in February. After extensive market research and testing, Toboggan acquired the LaON LT750 systems including 16 beltpacks from Broadcast Solutions. With the LT750 systems and using two repeaters, Toboggan covers the communication with all team members. The teams rely on an uninterrupted full-duplex connection between the 16 beltpacks and the base stations. All LaON systems operate in the 5 GHz UNII band and guarantee excellent connectivity. After completing a reportage photography project on the fishing trawler J. von Cölln, film maker and photographer Werner Lebert simply couldn’t wait to get back to the open sea. A year later, he was able to return to the J. von Cölln to make a documentary film on the lives of the trawlermen who take on the toughest conditions in pursuit of the catch. Also on board was a compact Sennheiser MKH 8060 shotgun microphone, which, just like the film crew, had to withstand the forces of nature.